“Tennis elbow” is the nickname given to a condition known to the medical community as lateral epicondylitis (also seen ending in -osis or -algia). This name describes the region from which the pain originates on the outside of the elbow. 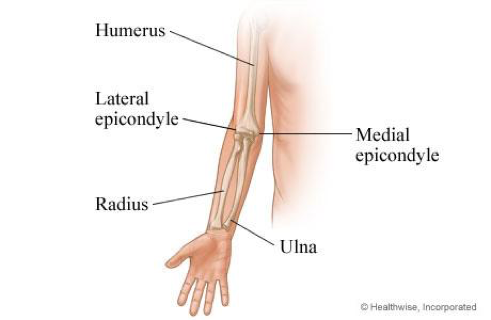 The lateral epicondyle is the part of the upper arm bone that serves as the origin for all of the muscles that extend the wrist. Tennis elbow is considered an overuse injury. It typically occurs after repetitive stress to the involved region over time, however one traumatic incident such as a fall or work accident may also cause inflammation in this region. Tennis elbow got its name because it is a common overuse injury seen in those who play the sport. Tennis players tend to hold a tight grip on their racquets while producing powerful forces with their wrist extensor muscles. In certain cases, this may be a recipe for inflammation. Another common population that tends to get tennis elbow is the office worker. Being in a position of wrist extension while typing for prolonged periods may cause repetitive stress to the outside of the elbow. Your physical therapist will design a specific treatment plan tailored to your needs based on your background and activity level. The program will consist of soft tissue mobilization to assist in the healing process, stretching/mobility training, functional strengthening of eccentrics (the muscle’s ability to control movement from wrist extension to wrist flexion) and grip strengthening, training of ergonomics and posture, and education on how to prevent the condition from reoccurring. Your specific program will depend on how you acquired the condition in the first place. An office worker will be trained to alter their desk setup in order to decrease the stress on the wrist extensors. A tennis player may be prompted to consider changing the thickness of their racquet handle or the tightness of the strings. Both of these variables may help contribute to the repetitive stress that occurs during the sport since more force production is necessary to produce the desired effect when these conditions are not optimal. This picture shows one way to stretch the wrist extensor muscles. Newer PostHow Can Physical Therapy Help My Sciatica? Older PostWhat is Assisted Stretching and How can it help me?